Many diet plans will advise you to eat disproportionately small or large amounts of a particular kind of food. Although these aren't as healthy for long-term weight loss as a nutritious diet in moderate amounts, they can produce dramatic short-term results. Cutting out white rice is one recommendation that can potentially have both positive and negative effects on your weight-loss progress. You lose weight by burning more calories through metabolism and other activity than you take in by eating. To do this, you must either exercise more, eat less, or both. It takes roughly 3,500 calories of energy to put on or take off a single pound of fat. 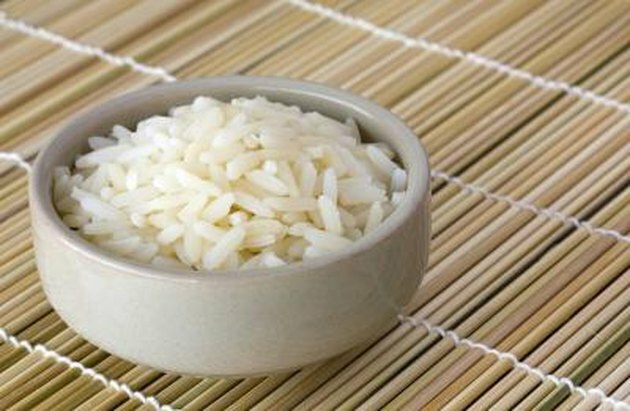 There are many kinds of white rice available, ranging from short-grain sushi rice from Japan to long, slender Basmati rice from India. White rice is a refined grain, meaning that the bran husk has been removed from the endosperm. According to the Livestrong MyPlate, a 1-cup serving of white rice contains about 110 calories. Nearly all of these calories are carbohydrates. From a calorie-counting standpoint, white rice isn't a bad choice. It contains fewer calories by volume than many other food choices -- meaning you can fill up on rice with fewer weight-loss problems. This assumes that you're eating your white rice plain, and not covering it with butter or sauces. According to Dr. Walter Willett of the Harvard School of Public Health, people on a calorie-restricted diet should make the most out of the calories they do take in. White rice is fairly low in calories, but also low in nutrition. This makes it a suboptimal choice, since you get less value for these calories than you would from eating vegetables or lean meats. Refined grains like white rice present a weight-loss challenge in that they break down very quickly in your digestive tract. This floods your bloodstream with glucose and causes your pancreas to release a corresponding flood of insulin. The insulin protects you from the damaging effects of elevated blood glucose by storing it in fat cells for later use as fuel. However, after the extra glucose is tucked away, your elevated insulin levels leave you craving more food. This means more between-meal snacking and less luck with losing weight. White rice has both positive and negative characteristics when it comes to losing weight. This means that cutting out white rice may or may not help you get reach the weight you want. Ultimately, it will depend on the overall context of your white rice consumption. If you cut white rice out of a diet made up of lean proteins and vegetables, it will help you lose weight. If you stop eating white rice and replace it with white bread or potato chips, you may put extra weight on.